Plant Health Passport Scheme - All plants are Elite and A Certified Stocks. Space the plants 40cm (16in) apart. Water well. It’s a good idea to mulch around the plants with a thick layer of well-rotted manure, planting mats, compost or straw (some gardeners grow their plants through black polythene). This impenetrable layer will prevent weeds from growing and competing with the plants. We prefer the bed mats made from Mypex. It will also keep the soil moist so you won’t have to water the plants as often, and prevent soil splashing on the fruit. 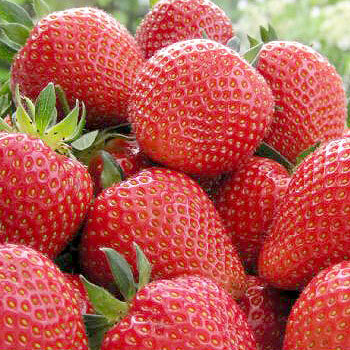 Strawberries are the most popular soft fruit for growing at home. Planting considerations. When preparing pots for planting strawberries, use soil less composts or those with a low loam content, as these weigh less and make heavy containers such as large terracotta strawberry pots more portable. Strawberries like well-drained soil that is rich in humus, so dig in lots of compost or manure. They prefer to be planted in full sun, and sheltered from the wind. Delivery Charges - The delivery charge is worked out from the weight and the size of the plant. We have several rates that apply to UK mainland addresses. The lower postal rates range from £2.80 - £5.70, will be applied to smaller orders of the lighter plants like currants, raspberries, gooseberries, blackberries, asparagus and strawberries although larger orders will go into the £10.00 rate. A higher rate of £18.00 - £32.00 will be charged for deliveries to European Countries and GY KW IV AB PH KW HS ZE IM BT DD JE PO30 PO31 PO32 PO33 PO34 PO35 PO36 PO37 PO38 PO39 PO40 PO41 Postcodes. Once you have put together your order the delivery charge will show before payment. All orders are despatched in one delivery. Bred at East Malling Research, this elegant selection is another outstanding variety that can be successfully grown for the home gardener. Cropping at the same time as Elsanta, Sweetheart has attractive berries which are uniformly conic, larger and slightly darker than Elsanta, with good skin strength. I thought I would give this variety a chance. I don't know much more about the potential cropping property than the description above. Very good supplied plants with an enormous root system for runners. Great root systems. Looking forward to picking some nice berries.